Tigo emerged in the mobile market of Rwanda in 2008. Later, Tigo merged with Airtel and became known as Airtel-Tigo operator. Working under dual brand, the company became the largest player in the Rwanda market. Currently, it owns about 58% of all subscribers in the country. 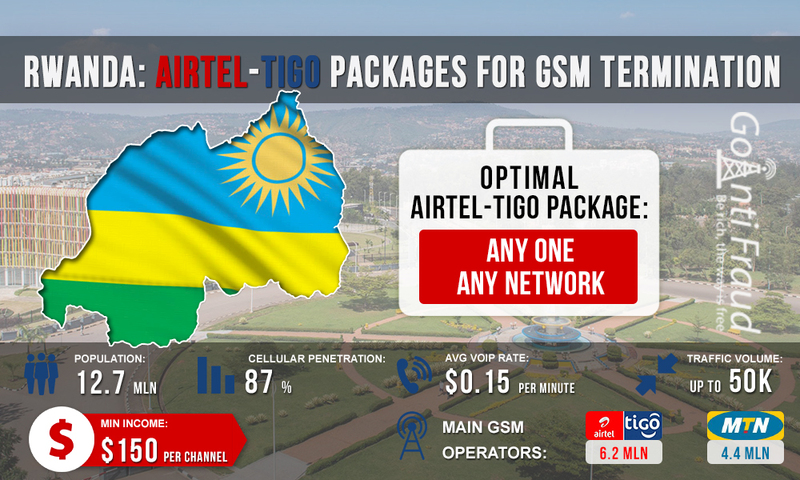 Airtel-Tigo’s coverage is slightly worse than that of MTN, but local call rates are lower. The low cost of services makes the starting plans of this operator a good solution for making money on termination. SIM cards are cheap in Rwanda - they cost about 60 cents. Airtel-Tigo starting plans can be purchased at operators' stores or by posting an ad on a dedicated online forum. On dedicated resources, you can find dealers who sell new SIM-cards already registered in someone else's name in large amounts. Jama Packs. This range includes four packages: Daily 100 (for one day, 30 minutes for $0.11), Daily 200 (for one day, 40 minutes for $0.28), Weekly 300 (for 7 days, 70 minutes for $0.34), Monthly 500 (for one day, 100 minutes for $0.57). The minutes are valid only for calls to Airtel-Tigo phone numbers. Any One Any Network. Calls to any network just for $0.04 a minute. The best option for the terminator in Rwanda is the Any One Any Network tariff plan. When the gateways work for five hours a day, your earnings will be about $200 from a single GSM channel. If you start a voip business in africa, you will need reliable protection of cards from the SIM-blocking. Blocking of cards by mobile operators is the most common problem when working in the field of termination. Order a turnkey solution from GoAntiFraud!